All Photos by Lloyd Photographers. This elopement was very intimate, with just the couple and one close friend in attendance. Stormy and Gary were wed on the bank of the river, beneath the natural arbor of a moss-covered tree branch. At their home in Knoxville, Tennessee, Stormy and Gary connected with TreeHouse Point online while searching for the best elopement venues—they fell in love with the magical feeling of TreeHouse Point's photos. “When our friends see our pictures now and say it all looks so beautiful, I just try to tell them what it’s like in person," Stormy muses. "They have to stay there to fully get it: it truly makes you feel like you’re in a fairytale. We were just in awe." 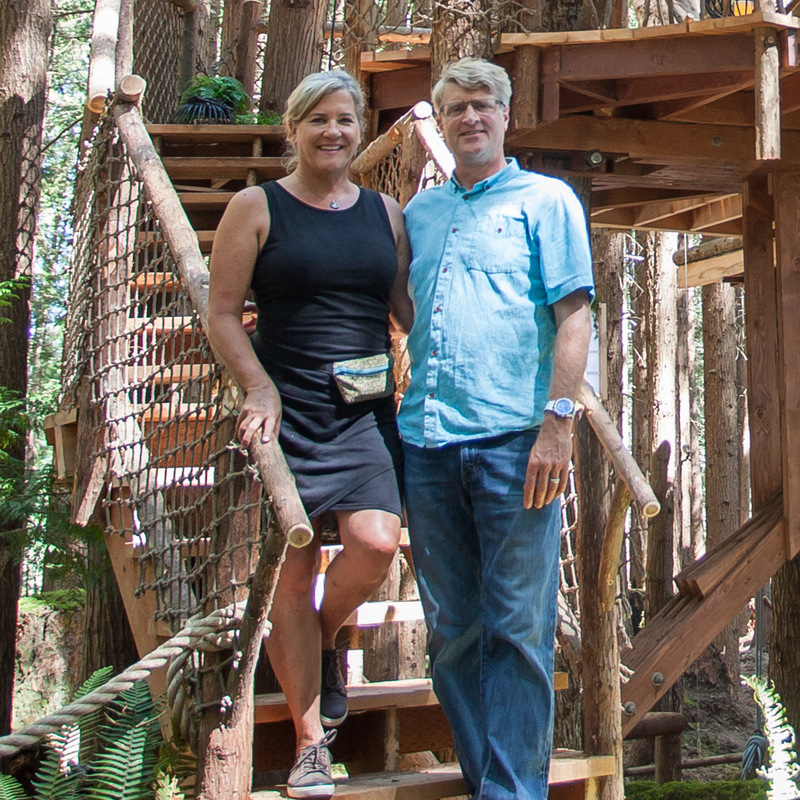 The prospect of getting married among treehouses also carried sweet nostalgia: Stormy’s father had built her and her brother a treehouse when they were kids, so seeing TreeHouse Point brought back that childhood feeling of wonder and play. Stormy met Gary through her work as a phlebotomist—Gary had come in one day as a donor and the two hit it off. A few weeks later, Gary returned and asked for Stormy’s phone number. She agreed, but accidentally gave him an outdated number—she was crushed when she realized her mistake! Not to be deterred, Gary returned to Stormy’s workplace again after some time to get her up-to-date digits. His persistence paid off: the two moved in together less than six months later and started talking about marriage shortly after that. Gary proposed at their home a few days after Christmas last year, in the company of their best friends. Stormy knew Gary was the one because of his steady and centered disposition. “He truly is the calm to my storm," Stormy says with a laugh. When Stormy and Gary began planning their day, it became clear that the simplest and most budget-friendly option would be an elopement. “I think other couples also have this experience of trying to balance other people’s involvement, all the stress of planning, and all the expenses, while figuring out how to stay true to what you actually want to do,” Stormy conjectures. Stormy was still in school when she and Gary were planning their day, so choosing to elope was key in making it all feel manageable. Stormy and Gary took advantage of their destination elopement to explore the American West: the couple flew into California the week before their big day and drove north with pitstops at Disneyland, Los Angeles, San Francisco, Portland, and Seattle. For their honeymoon, the two worked their way south again through the redwood forests and then east to see the Grand Canyon. Stormy says one song that could be the soundtrack to her relationship with Gary is “You Make it Easy” by Jason Aldean—they often sing it to each other. Even though everything went so smoothly day-of, I’d say there’s a point to visiting the venue beforehand to get a sense of the layout and the place. I didn't have a chance to visit before the day—I think it would have helped me feel calmer in the lead-up, just knowing what to expect. I’d also say it was essential to have a close friend there to help with everything from getting dressed to sharing in the emotions of the day. If you’re going to elope and want to keep it small, I’d still definitely invite at least one friend. On their way to TreeHouse Point, Stormy and Gary swung by a gardening supplies store to pick up a baby blue spruce and some soil—they showcased this tree at their ceremony and planted it at their home back in Tennessee. This tree is such a beautiful way to symbolize their shared growth and the beginning to their life together as a married couple! After their elopement, Gary and Stormy stayed in the Burl treehouse overnight. A highlight of their stay was joining other couples at the communal table in the Lodge during breakfast the following morning. Stormy and Gary hope to revisit TreeHouse Point next winter for their one-year anniversary. the couple celebrated with champagne and cake inside the burl treehouse. Thank you for hosting your elopement at TreeHouse Point, Stormy and Gary! We wish you a lifetime of happiness!